Geri turns the tables. Harold and Madge are at a stand-off as Harold prepares for his role as school lollipop man, and will Joel ruin his sporting chances for life? Libby is up in arms over Drew and Geri. Joel acknowledges his limitations. The 'Desperate and Dateless' night produces surprising results. Tad is embarrassed about his learning difficulties. Lance wants honesty from Amy. Hannah is in hot water with Paul and Phil. Susan tests Karl. Paul is suspicious of Hannah as she still stays in contact with Pascale via e-mail. Paul tells Harold he is an embarrassment. Harold battles the world and his work as a school crossing supervisor leads to problems at home. Paul battles the French Connection, and Joel keeps a stiff upper lip. Drew is confused when Geri wants to cool their relationship. Joel regrets betraying Drew's admission of love for Libby. Karl and Susan are heading for the rocks when Susan refuses to read the letter Sarah sent to Karl. Joel tells Libby a few home truths. Geri digs her hooks into Drew. Lance is the pawn in Megan's cruel game - he is confused - should he keep going with Megan, or throw it all in for Amy. Bill insists Amy tell Lance about Megan's bet. Lou makes waves at the exclusive Eden Hills Club, and Bill confronts Anne over her feelings for Fanto. Still reeling from the informaton that Megan is only going out with Lance as part of a cruel bet, Amy receives more information she'd rather not know. 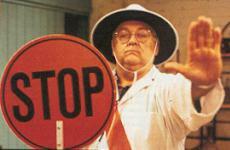 Paul dumps Hannah, and Harold collapses at the school crossing. Karl hopes that his relationship with Susan will improve before his trip to Sydney. Can Geri and Drew escape the past? Harold is shaken after his collapse and fears his amnesia is returning and Tad faces a forced return to Tindara and asks Toadie when he can move back into Number Thirty. Lou questions Phil's friendship when he buys a bottle of wine at an Eden Hills Club charity auction, certain his extravagent gesture will ensure him membership of the club. As Joel begins training tentatively, along the way he finds an unlikely training partner. Bill and Anne accuse each other of treachery. As Lance is devastated by the truth about Megan, he decides to shoot through. Harold's receives his test results, but his pleasure is short-lived when he discovers his famous seedlings are dying. Anne ponders the future of her relationship with Bill following the accident. Toadie drives Amy and Anne down to the river where Lance is. Toadie embarrasses Amy. Hannah twists the truth about Pascal not coming to Australia, and there is an intimate moment for Amy and Lance. Lou offers to help out on Harold's allotment and discovers a dangerous weedkiller - could this be the cause of his friend's illness? After spending an intimate night by the lake under the stars, do Amy and Lance want to go down that road again or stay friends? It seems Tad's return to Tindara in inevitable, and Susan takes a walk down memory lane with old flame Martin. Harold suspects Lou has been poisoning him. In a moment of weakness with Joel, Libby confesses that she does have feelings for Drew. Lou finds himself in hot water and tries to cover his tracks by denying all knowledge of the tax fiddle. Libby faces the fact she's missed her opportunity with Drew, and Geri rubs salt into her wounds by getting a job at the pub. Lou's tax 'solution' bites back. Anne and Fanto are too friendly for Bill's liking when Bill sees Fanto walking Anne into her place. Joel gets back on the road training hard. Bill makes a shocking discovery at the workshop. Bill's dismay at finding his workshop trashed by vandals is doubled when he finds a door unlocked and realises that he won't be covered by insurance. Madge gives Harold a new lease of life. Libby and Geri are not looking forward to their shift together at the pub, though neither will admit it. A desperate Bill's plan to cover up the fact he left his workshop unlocked backfires. Paul and Tad are obsessed by a BMX bike and Geri demands the truth - is Drew still in love with Libby? Amy and Lance are still keen to move into the spare room at Number Thirty? It's a case of may the best person win. While Toadie and Joel evaluate the success of the party, Amy and Lance remain neck to neck in the race for the room. Joel and Toadie devise a plan to get themselves a couple of personal slaves - with Amy and Lance only too eager to oblige. Lou reminds Phil of his moral obligations, and Harold threatens Lou with legal action following the results of his blood tests. Harold is determined to sue Lou, despite Madge's protestations. Paul faces a tough decision - should he buy a present for Hannah or a new bike for himself? Susan and Martin grow closer, and a guilt ridden moment follows for Susan. Harold stands by his decision to sue Lou. Susan is having difficulty dealing with her feelings for Martin, confused she seeks counselling - is she just trying to get back at Karl? Drew persuades Harold to consider the consequences of his decision to sue Lou, and Libby seeks flight from her feelings for Drew and decides to apply for a new job. 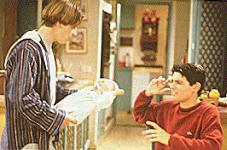 Paul and Tad face up to the responsibilities of parenthood. Geri questions the reality of her relationship with Drew. Susan and Martin try to deny their mutual attraction. Paul is confident Hannah will love his gift, but it only stirs up bad feeling. Hannah refuses to let go of her desire for plastic surgery, but Phil has had enough and believes it's time to teach Hannah a little lesson. Susan tells Martin to keep his emotions under wraps, while Bill believes he stands a chance with Anne. Anne, who is still confused about her own feelings for Bill, realises the level of David's attraction to her. 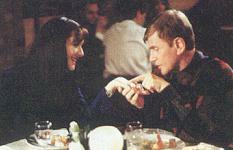 Phil has seen the way David looks at Anne and cautions her about her continuing friendship with him. The investigation into Lou's tax affairs is imminent, and Lou's stress levels skyrocket. Thankfully he finds support from Harold. Geri tells Drew about Libby's overseas plans, and Amy plays the dating game with Joel's rival Spiro. Lou's tax troubles deepen when Harold drops his plans to sue him, and Libby wants Drew to give her a reason to stay in Erinsborough.